When Technology Does NOT Work! - ABE S.O.S. When technology just does NOT work! See BELOW for troubleshooting tips! How do I "attach" a file? Refresh your browser. Click here to learn how to. Open the website in a different Internet Browser. To the right are pictures of Browsers. A Browser is the software your computer uses to "browse" the Internet pages. Make certain all necessary Plugins are downloaded and installed. 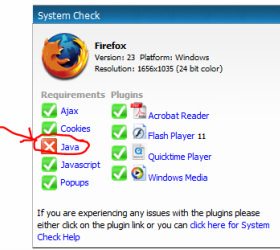 Hint: If those plugins are properly installed on your computer, the Angel System Check should have all green check marks (vs. red X's) . Log out of Angel to see your System Check on Angel's home page it will look similar to this picture. Clear the Cache in your memory. What?! Your Browser stores the web pages you open. Sometimes, we have to tell it to look at new pages vs. the old pages. Don't panic, simply select the Browser below which you are using and follow the pictures! Ask your instructor for help. You must log out of Angel to see your System Check. Have a technology tip? Select the News forum below and add a post to the topic we started!